The Central Kansas Educational Opportunity Center is one of four TRIO programs at Barton Community College. CKEOC is 100% funded by the Department of Education therefore all services are free. Continue reading to learn more about the services offered through the CKEOC! Are you an adult, and or Military connected, who has thought about returning to college or perhaps enrolling in college or vocational training for the first time? Are you at a loss about where to go or how to begin? 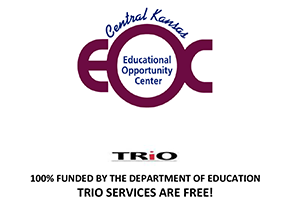 The Central Kansas Educational Opportunity Center (CKEOC) has been developed to respond to the increasing educational need of adults. CKEOC is allowed to serve those under the age of 19 due to services of a Talent Search Program not being available within the CKEOC target area. For more information, visit the CKEOC webpage!